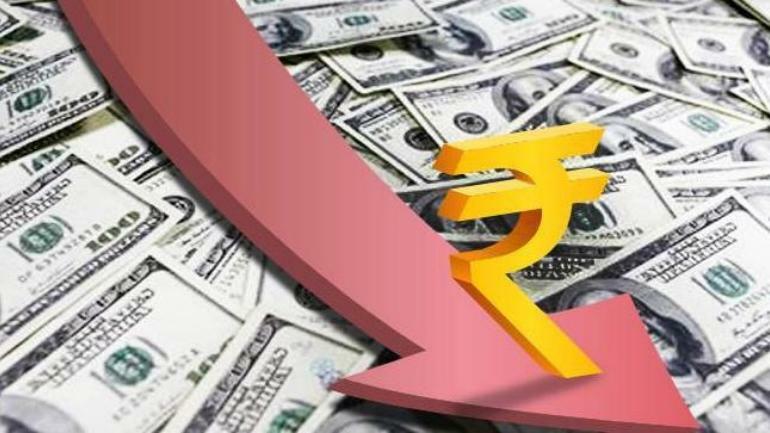 Mumbai: The rupee fell 33 paise Tuesday to finish at a fresh lifetime low of 74.39 against the US dollar on high crude oil prices, strengthening of the greenback and unabated foreign fund outflows. At the Interbank Foreign Exchange (Forex), the rupee made a cautious recovery of 18 paise to 73.88 against the US dollar in early trade on fresh selling of the American currency by banks and exporters. However, the domestic currency failed to sustain the momentum after Brent crude breached the USD 84 per-barrel-mark again and the US dollar strengthened overseas. Falling for the sixth straight sessions, it finally closed at 74.39 against the US dollar, down by 33 paise. On Monday, the domestic unit plummeted by 30 paise to close at 74.06. Traders said unabated foreign fund outflows weighed on the rupee. Foreign institutional investors (FIIs) sold shares worth a net of Rs 1,805 crore Monday, provisional data showed. Investors remained concerned over sustained foreign capital outflows and rise in crude oil price to USD 84.48. Forex dealers said besides strong demand for the American currency from importers, concerns over rising fiscal deficit and capital outflows weighed on the domestic currency. Traders said rising crude oil prices and higher US bonds yields resulted in weak Indian currency. Nomura further noted that policy responses to the depreciating currency have been muted thus far and with limited policy response, the concerns on the rupee have risen significantly. Meanwhile, the BSE Sensex erased all its early gains to end lower by 175 points in see-saw trade Tuesday, posting its fourth fall in five sessions. The 30-share Sensex opened higher at 34,651.82 points but slipped into the negative zone to hit a low of 34,233.50 before concluding at 34,299.47, recording a fall of 174.91 points, or 0.51 per cent. Similarly, the NSE Nifty after shuttling between 10,397.60 and 10,279.35 points, ended 47 points, or 0.45 per cent, lower at 10,301.05.